Okayyy.. fine. I knowww, both also are definitely not me. I mean, my scarves are surely not as fabulous as it seemed. (They're not from Chanel! Or at least, they're not from 'Denny & George'! hehe ;p). And I am absolutely not a fab girl. I have a bad breath, when I wake up in the morning. Euwww. Anyway.. yesterday when I was looking through my scarves collection, to see which one shall I let go to get more space for my new scarves that I just bought, I realized that I got a lot of scarves that I did not even know they existed in my closet! - because they're too crowded in there, and I couldn't see that poor little scarves that were hiding underneath the other scarves! Sorry honey, mummy didn't know you're there! I promise I'll bring you out to see the world soon, ok? And I don't like putting them on top of one another.. I find that so leceh..and sometimes, I won't be able to see them, and can't seem to remember I have this or that color/style...especially when I'm running late..
And that to me, is really annoying sometimes.. Especially when I thought the tops that I'm gonna wear do not have a matchy scarf to go with it..and then, I ended up wearing something else.. Sigh. My favourite hanger among these four, would be these two! - I always find myself wearing these two shades, the most! Thus you won't ended up looking like Makcik Kiah Takde Iron Dekat Rumah, if you wear the not so lembut type of materials on your head.. - But if you do wear any of the silky types, then don't forget to put a handful amount of starch before you iron them! 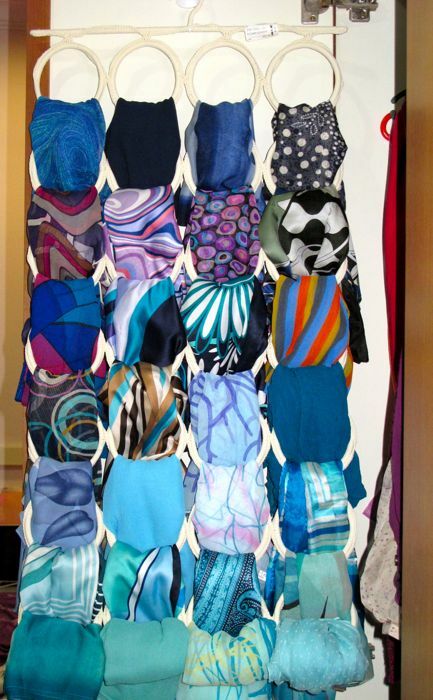 I ada 3 je hanger of Tie Rack scarves. Tapi still rasa tak cukup kan? Nampak je yang cantik, mesti rasa nak beli lagi. weh wanie!! 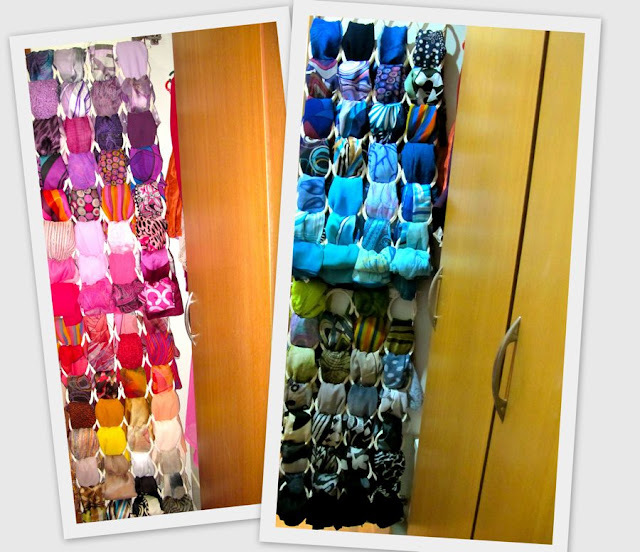 betol la..becoz of the crowdedness, usually i hang up my scarves on top of another jek! pastu dah x sedar dh kewujudan beliau2 di hanger berkenaan..huhuuuu..
hi wani. 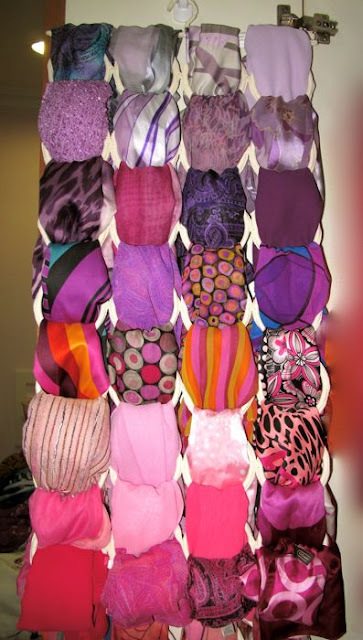 i really love the way you arrange your shoes and scarves. omg. there's a lot! love it! Thanksfor giving me an ideas! oh i loveee your blog! never fail to light up my day! INDEED, YOU'RE AN AWESOME GIRL!!!! Love you wany! Love all your stuff! 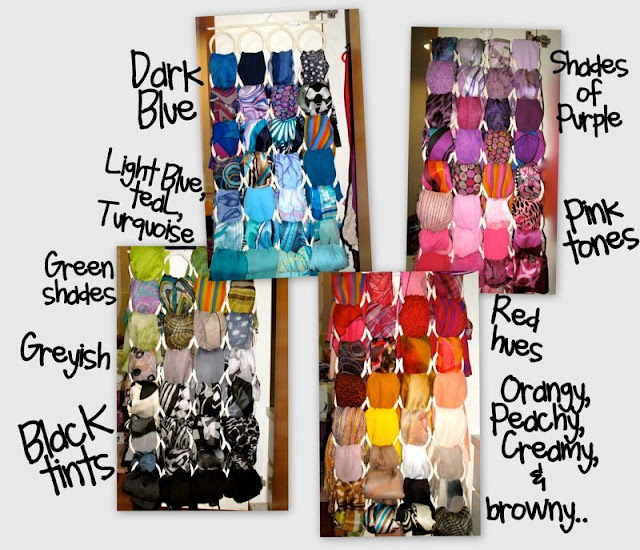 awesome collections! 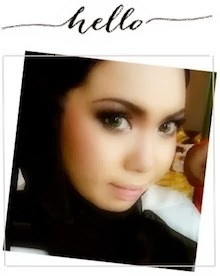 yani: thanks! yeah, maybe u shud do it too! senang nak pilih scarf nnt! ya Allahhhhhhhhhhhhh. berupisng maata tengok koleksi awak wani oi. have a good day yea. Ha'ah la Wani.. i pon nak tanya soalan yg sama.. macamana u pakai skarf ni yer? sebab bila i pakai, selalllluuuuuuuuuuuuuuuuu sangat nak jatuh ke depan.. macam badut pulak.. haha.. tak kemas langsung.. plz wani bg tips sikit... n cara nak pakai skarf ni.. thx..
banyak nyeee :) suka tengok banyak2 cenggini. wah... cantik2 la design skaft u..